If you click on the blue words it takes you to the website for each textile place. That is where you will find the address. 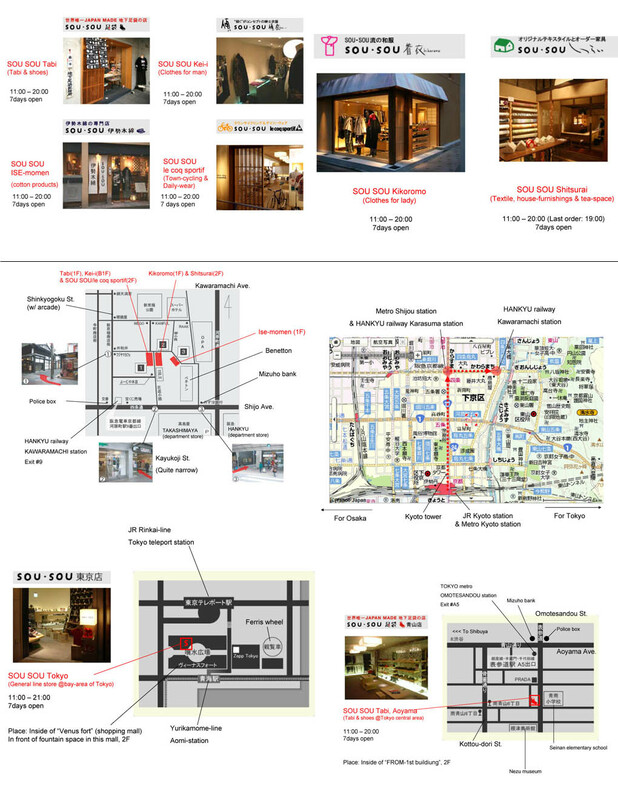 The tourist information centre at Nishijin will help you find textile workshops and classes. This is the big Kyoto centre for textiles which the tourist information centre sends everyone to. You can arrange to do a class. They also have kimono fashion shows at 2 pm each day i think. Best to check on their website by clicking on the word Nishijin (the heading). Ask at the Tourist Info or at Nishijin for the instructions. Lovely fabrics. A small museum with amazing huge multicoloured shibori panels. Has small silk peices for sale as well as scarves and kimono lengths. Video is in japanese but easy to follow the steps. I think you can arrange to do classes with them but would need to sort this in advance. This group of shops sells clothing items based on traditional Japanese crafts. They sell the most bizarre sneakers which have split toes. From Kyoto you can get to Nagoya and from there to Arimatsu to see the shibori museum. Click the word above to take you to the website for the Arimatsu Shibori museum which does workshops. The website is in English. To get to the shibori area cross the railway and turn pretty much straight left into a really old looking street. If you find yourself climbing up hill you have gone too far. I haven't had a lot of time to explore Osaka itself for fabrics but really enjoyed the Museum of Ethnology (Minpaku) which has loads of lovely costumes and textiles and a great gallery which has temporary exhibition, often textiles. You have to walk through the park to get there which is lovely. Go to their website by clicking on the blue writing and then click access on their web page to find public transport to get to the Museum. Kurashiki is worth a day trip from Osaka, Kyoto or Hiroshima. It also has lots of lovely canals, cherry blossom, galleries, shopping, pretty stuff. I go there every trip as it is a favourite. From the station front entrance - go to your left, cross the road via the pedestrian over bridge, turn left and the entrance to the shopping street is on your right not far away. There is a quilting shop in that covered street too. At the end of the covered street turn right and you get to the old area of town.